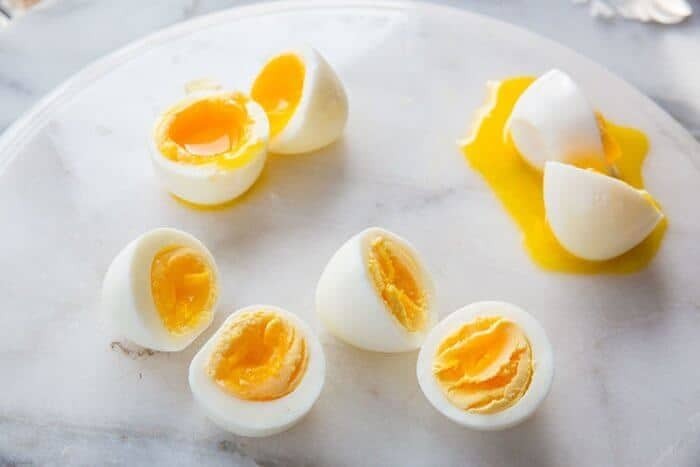 Dad, this post on How to Make Perfect Instant Pot Eggs : Soft, Medium & Hard Boiled is for you and your new Instant Pot!It’s also for everyone else that really wants to know how to make eggs in their Instant Pot, from soft boiled, medium boiled and hard boiled. Now funny enough, my 5 minute Instant Pot hard boiled eggs look nothing like everyone else’s eggs and that is because everyone lives at different elections! Everyone says that 5 minutes will get you hard boiled eggs, but I wouldn’t consider 5 minutes super hard boiled. I would use those 5 minute eggs for deviled eggs, but not for egg salad. I would cook mine 6 minutes for really hard boiled. I noticed that when I was looking for a timeline for eggs in the Instant Pot that most posts had 3 or 5 minutes. Of course the curiosity in me was peaked – what about 4 minutes? What about REALLY soft boiled eggs, the type that you put into an egg cup, tap the top off and then you dip toast soldiers in, which had to be lower than 3 minutes..what about 2 minutes?So I went and experimented – and of course made a video so that you can all see what YOUR perfect Instant Pot Egg looks like! I found that my perfect egg for a hot breakfast is 3 minutes. A lot of yolk but not as much as the 2 minute instant pot egg. That egg however is what I would make for egg cups and dippy toast soldiers, don’t you think? I think that the egg at 4 minutes would be the one that I cooked to refrigerate and eat during the week. I loathe when hard boiled eggs get so dry inside that you have to wash them down with a glass of water – you totally know what I mean! When someone overcooks eggs, yikes! It’s a yolk desert inside! Now, I went and bought extra stuff so I could do this post for you guys! First of all, another metal pot insert so that I could use it cool for each egg. ( Yes, I can be that much of a nerd! I had to control the variables haha!). I am thinking that perhaps all the other write ups for the 5 minute hard boiled eggs were done with pots and water that were already hot from testing 3 minute eggs? That WOULD make a difference! I started with cold water. And my brand new egg racks. How Many Eggs Can You Cook in an Instant Pot at One Time? Dad, if you are reading this, you need to get egg racks. 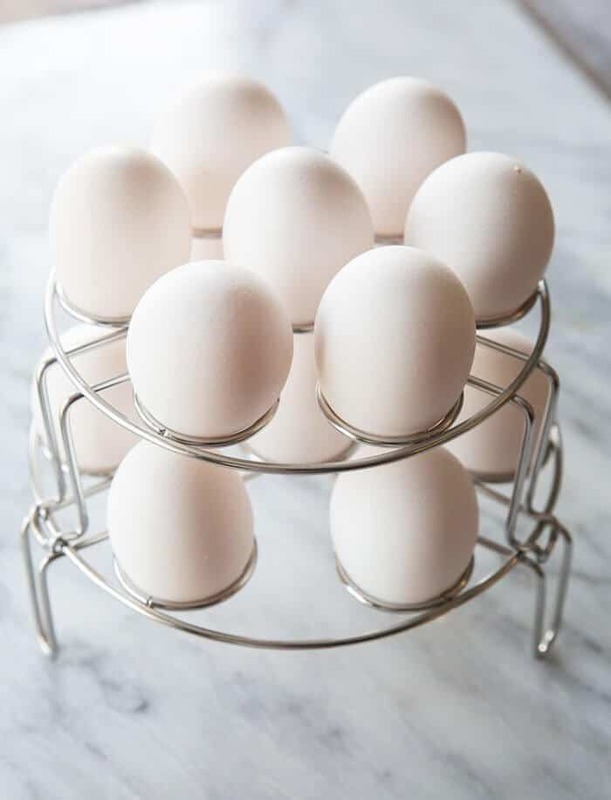 Actually, if anyone else is really serious about eggs then you need an egg rack. Hard or soft boiled eggs are usually what Mike and I grab for breakfast most days. We keep a stash in the fridge at all times to snack on whenever we need a quick healthy protein boost. This is the one I bought and it works like a charm! I got an egg slicer with mine though, haha! This is one accessory I will being using weekly! This allows you to cook up to 14 eggs in the Instant Pot at one time! You can order one or two pack racks and I prefer the ones that hold 14 and stack in the pot. I want you to imagine cooking eggs for deviled eggs. Potato salad. Egg salad sandwiches. OH OH OH and Instant Pot eggs peel so easily!!! Remember how I get so mad when eggs look like badgers chewed them? No more of that no matter how new your eggs are! So, what is YOUR egg? I want to know! 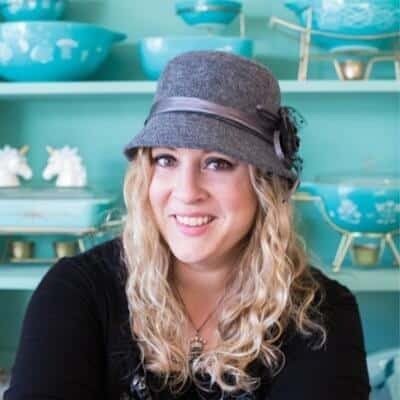 PIN THIS RECIPE to your INSTANT POT Board and Remember to FOLLOW ME ON PINTEREST! 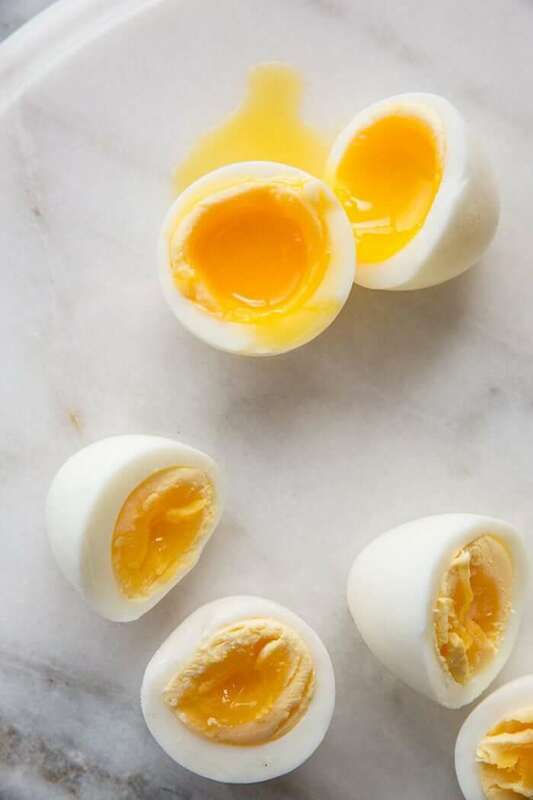 How to make your perfect egg in the Instant Pot, whether it's soft boiled, medium boiled or hard boiled! There's an egg for everyone! Add the water to the bottom of the pot. If you are using the rack that came with your Instant Pot, you can fit 6 eggs at a time. I would leave space between them on the rack. 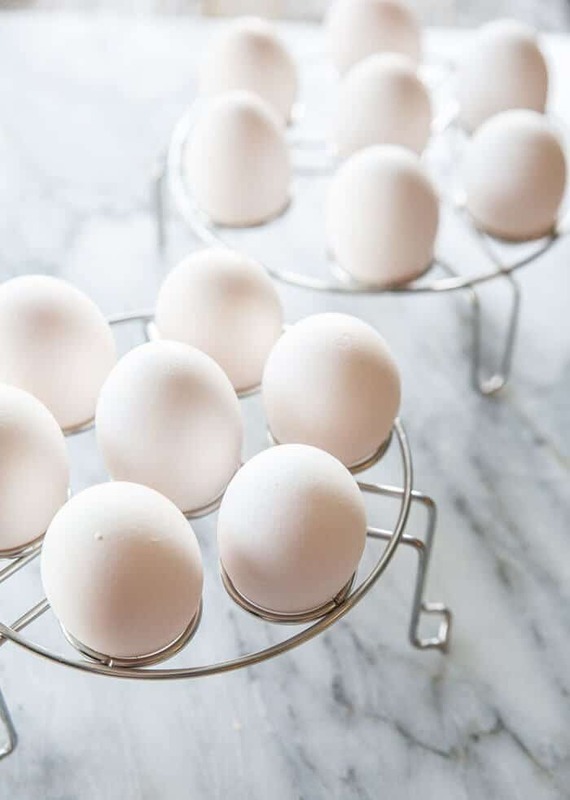 If you are using the racks that hold up to 14, fill them up with as many eggs as you want, making sure to balance them out evenly. Don't put all the eggs on one side. 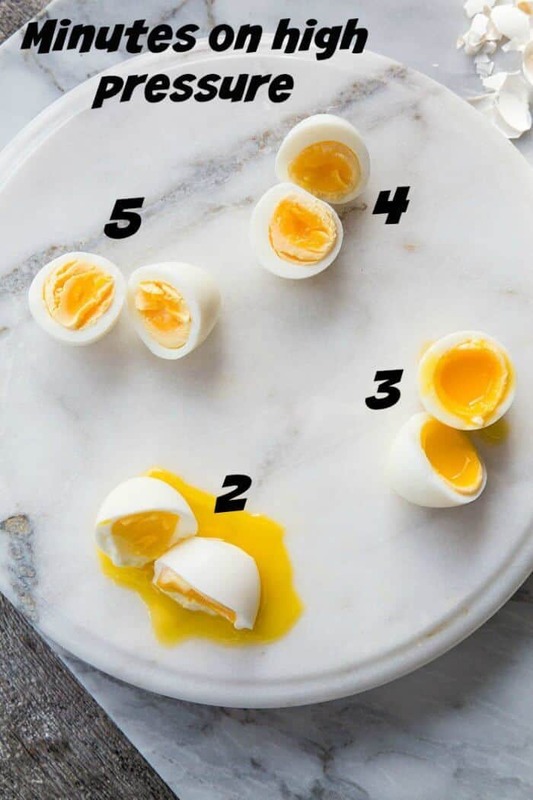 Pick the amount of time you would like to cook the eggs by taking a look at the photos. For really hard boiled, I would cook at 6 minutes high pressure. Press the manual button, then adjust the time on the Instant Pot screen by using the plus or minus symbol. Place the lid on top and flip the knob on top to sealing. When the time is up, release the pressure manually by placing a tea towel on top and turning the knob to release the pressure. Do this very carefully as steam comes out and can burn you. Find YOUR safe way of releasing the pressure manually. Plunge the eggs into an ice water bath. When the eggs are cool enough to handle peel and enjoy. These eggs were done at an altitude of 2200 feet, if you are a higher altitude, add on another minute for cook time for each step. Lower altitudes will cook faster. For every 1,000 feet above 2,000-foot elevation, you must increase cooking time by 5 percent. I have just put my eggs in my Instant Pot for 7 minutes (I live in Mexico City…way up high). I notice that you vent your IP manually after the cooking time whereas other recipes do 5-5-5. I am not sure what to do, but will follow your lead and cross my fingers! My eggs were perfect! Thank you so much! ? I bought the racks for my 3 qt insta pot and they don’t fit inside the stainless pot. Any suggestions?? Perfect 6 minutes for me, thanks! Takes me 4 minutes for my perfect egg, thanks! There isnt a place on here where you add the water to the pot. (Both dh and I read it mutiple times and couldnt find it. Just might want to edit that for the more simple-minded person that might have skipped that step) I tried to make #2 tonight and I didnt prep the ice bath in time so they sat for an extra min or 2. No dippie eggs for me and I was quite sad! We are also at 4500-ish feet in elevation. Excited to try them again. Are you starting with room temp eggs or cold from the fridge? This too can make a world of difference in cooking time. Altitude affects the time. The higher the altitude the more time you need. Good point!! I just looked it up and For every 1,000 feet above 2,000-foot elevation, you must increase cooking time by 5 percent for pressure cooking. I’m at 2200 feet. I added that into the recipe!